ARLINGTON, Va. (PNS) — Susan Orr came to her first Ecumenical Advocacy Days in 2013, and the past several years, she’s been loading up the van with friends and colleagues in April to make the eight-hour drive from Rochester, New York, to Washington, D.C.
“In 2015, I said, ‘I’m going back. Who wants to come with me?’ ” Orr said Sunday night, after the closing plenary for Advocacy Days 2019. “There were about four of us that time, but it just keeps growing. This year, we have a group of seven — one pastor, six ruling elders representing six of our congregations. (Top, L to R) The Rev. Dr. Teresa Hord Owens of the Disciples of Christ preached at Sunday morning worship; The Rev. Jim Kirk held down the fort at the Presbyterian Disaster Assistance booth; Presbyterian Hunger Program associate for International Hunger Concerns Valéry Nodem spoke at an early Saturday afternoon panel moderated by Catherine Gordon of the PC(USA) Office of Public Witness. (Bottom, L to R) Melanie R. Smith of Philadelphia played for Sunday morning worship; Members of the Kentucky delegation to Ecumenical Advocacy Days plan for meetings with legislators on Capitol Hill. “I can’t even put into words what these types of conferences allow for,” said Orr, presbyter for healthy congregations and stated clerk for the Presbytery of Genesee Valley. “When people think of advocacy, they think of people marching in the streets. That’s the sort of thing that makes a lot of Presbyterians uncomfortable. So, it’s helping people understand what advocacy is, and giving them the tools to help them do the work. As Orr said that, she and her New York State compatriots were preparing for their last night in Arlington, Virginia, across the Potomac River from Washington, D.C., where they would spend Monday morning lobbying their representatives on Capitol Hill for voting rights in the United States and human rights abroad. Monday’s lobbying day on Capitol Hill is the culmination of a weekend of training and education that, for Presbyterians, started with Friday’s Compassion, Peace & Justice Training Day at New York Avenue Presbyterian Church in Washington, presented by the PC(USA)’s Office of Public Witness. 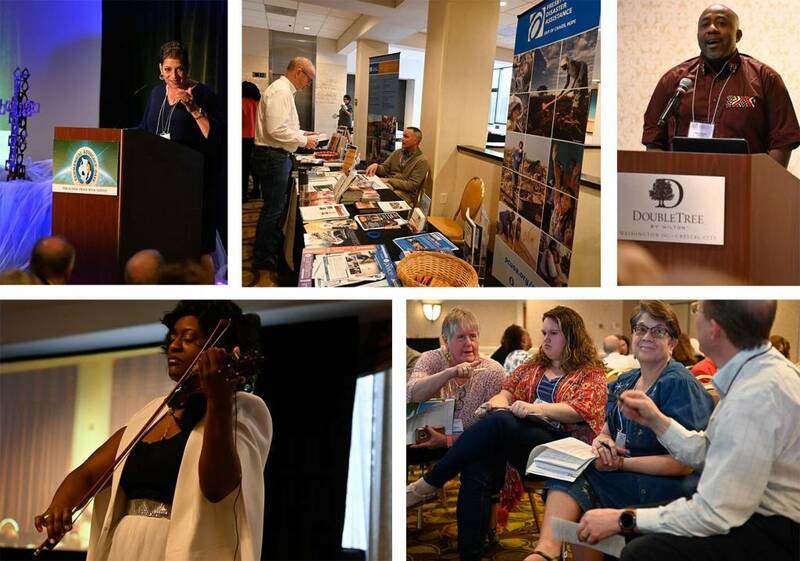 On Saturday, attention turned to the DoubleTree Crystal City hotel, where participants from a variety of Christian denominations participated in plenary sessions and workshops emphasizing the theme of movement-building. “The forefront of social movements has been people of faith, just like yourselves,” said the Rev. Adam R. Taylor of Sojourners, who shared a Saturday morning plenary speaking spot with Ana Garcia-Ashley of the Gamaliel Foundation. Participants had chances to explore a wide variety of topics under the advocacy umbrella over the next two days in panel discussions and workshops on topics ranging from immigration to gun violence and voting rights to public policy. Valéry Nodem, the Presbyterian Hunger Program associate for International Hunger Concerns, was something of a common denominator across the day, sitting on three separate panels from a main stage group on movement-building to an early afternoon discussion of hope for the global future, with several Presbyterian colleagues, to a late afternoon discussion of environmental defenders. Through the conversations, Nodem covered a variety of issues, from his own introduction to activism in his native Cameroon to his sadness over current conflict in Cameroon to his stress-relieving practice of naming tennis balls he hits while playing. As afternoon led into evening, Presbyterians gathered for a congregational meeting, where they heard denominational news, met leaders such as the Rev. Dr. Diane Moffett, executive director and president of the Presbyterian Mission Agency, and discussed issues common to their congregations. Smith is a regular Advocacy Days attendee and she said that this year, she noticed an emphasis on the interconnectedness of issues, or intersectionality, as opposed to focusing on one major topic. Things did get more specific late Sunday morning, following a worship service in which the Rev. Dr. Teresa Hord Owens of the Disciples of Christinvoked the story of the paralyzed man whom Jesus healed at Bethesda. She noted that according to the account in the Gospel of John, he lay near the pool every day, but no one helped him get to the healing waters. Hord Owens drew a parallel to barriers to advancement in society, such as poverty and the erosion of voting rights, that make it difficult for people to improve their lives. After some stirring violin music from Melanie R. Hill, attention turned to voter access and the Global Fragility and Violence Reduction act, the domestic and global issues that conference participants were set to take to their representatives Monday. Rather than breaking down by denomination, the participants gathered by state over lunch Sunday afternoon for training to prepare for their congressional visits. The Rev. Michael Neuroth of the United Church of Christ briefed the Kentucky, Tennessee and Minnesota delegations on their Capitol Hill visits, with pointers including how to enter the congressional offices and how to follow up with legislators. Neuroth’s advice included having personal stories to tell related to the legislation people would be asking about and not getting caught in the weeds of policy debate. “We come as people of faith, not policy experts,” he said. Following the coaching, participants got down to plotting strategy by state for senators and district for representatives. In some cases, that included divvying up responsibilities when schedules overlapped, and strategy included figuring out who would speak first, and who would say what. A majority of the meetings will be with congressional staff, as opposed to the legislators themselves. But Neuroth said that is just as valuable, as staff play a big role in shaping policy. And that can set the stage for more interaction down the road, back home.